I’ve recently taken to describing how we all, in small ways, degrade the system around us: through our actions, our limited vision, or the actions that hold us safe. We do this not because we are bad people, but rather because we are good people, who can never know or touch the whole system. We each have an imperfect view, and even good actions in one space can have unintended consequences elsewhere. But we can do something about this: by becoming more broadly connected, by engaging in stories of difference and dissent, by becoming more expert at listening, with humility, than speaking with power. How can you reach down? Instead of looking up, at what we can personally achieve, or take from a system, consider how we can help others, bring others up to our level, or create both space and opportunity. What can you give away? Not money, but things like time, expertise, access, resource, uncertainty, permission, or support. Who can you recognise? Not for achievement, but empathy, generosity, support, kindness. Not only who, but ‘how’ can you recognise them? Again, by creating opportunity, space, or support. 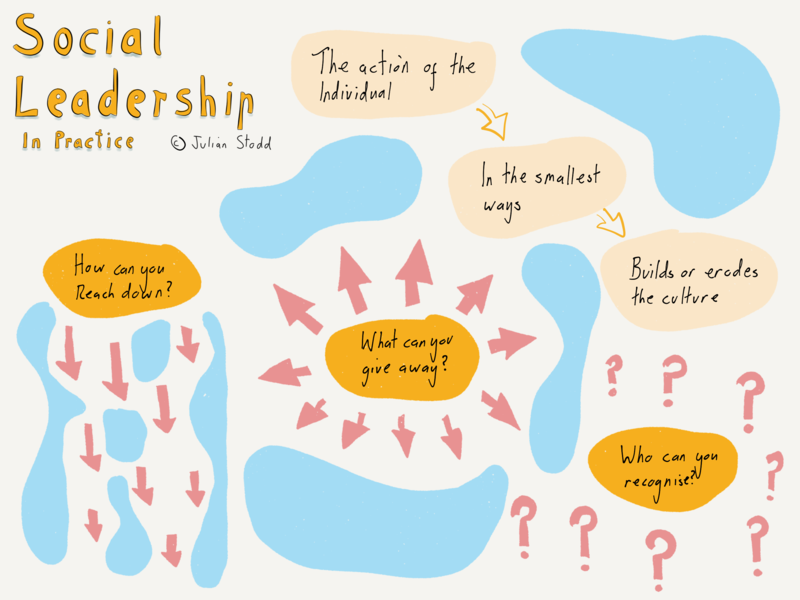 Social Leadership is not about monuments, hierarchy, and structural legacy. It’s about humility, kindness, and respect. Not within the system, but alongside it. This entry was posted in Leadership and tagged Culture, Generosity, Kindness, Leadership, Recognition, Social Leadership. Bookmark the permalink. Hi Julian – I am trying to find a copy of your book to purchase but it appears to be out of stock. Do you have any in stock I can buy directly from you? Pingback: Project Lift | Collaborate with us on communities – Week 2!